Our division INSCO temperature baths has developed a complete line of dry wells and liquid baths, covering a temperature range from -95 ° C to 1200 ° C. We designed special models, called multi-blocks, with temperatures from -90 ° C to 400 ° C, resulting in high efficiency and productivity, the model 780 can be calibrate up to 108 thermocouples. The fact of having 2 or 3 wells, depending on the selected model, allows these units to perform various calibrations of temperature at different points simultaneously, which is a very useful tool for instrumentation and metrology departments. INSCO is a pioneer in the manufacture of dry blocks at very low temperatures, characterized by high accuracy, stability and speed. The 787 and 737 models, with temperature ranges -95 ° C to 140 ° C , are great choices for clean areas and do not require any type of fluid to operate and are manufactured in stainless steel. 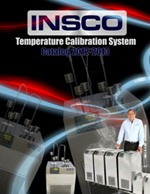 These units allow the user to complete a calibration process at several temperature points with great agility, compared to what they would need if they did it with a liquid bath. In most models of liquid baths in the market, cooling from room temperature to -80 ° C can take several hours, but our system can reach -90 ° C in just 46 minutes. The 737 model is the third generation of dry blocks at very low temperatures, specially designed for field applications due to its portability. The information contained in this website is subject to change to use materials delivered from this website and form and are used solely for non-commercial.